Story Running is an interactive way to motivate runners. A short time ago, if you entered a race you would have to pay a $40 chip deposit for the timing chip that you laced to your shoe. Nowadays, the chip is built into your race bib and doesn’t cost anything outside your entry fee. Moisture wicking fabrics that are lightweight, form fitting and styling are another element to the multi-billion running industry. Now you can add to the list of innovative ideas in the name of runner inspiration: Runtastic offers Story Running, which has become the newest trend in running. 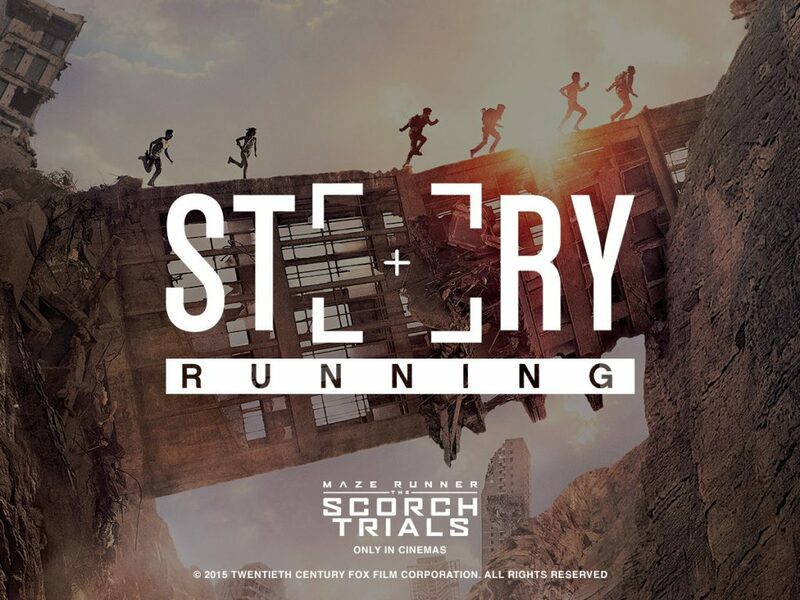 Runtastic and 20th Century Fox have teamed up to develop a brand new Story Run – “The Scorch Trials: Hunted.” Inspired by the recent movie Maze Runner – The Scorch Trials, listeners are transported into the movie’s story line and join the cast in escaping the perils of the Scorch. The new Story Run is now available just in time for the global release of the movie which is now in theatres. I had the opportunity to listen to this Story Run while jogging the trails. I plugged in my ear phones and found it to be a unique enjoyable experience as this was my first Story Run. I was immediately immersed in the story while I found myself being part of the story, jumping over fences, and running with very little light in the tunnel. It motivated me to run faster especially during certain periods, like when the Cranks – infected by the Flare virus – are chasing me. It was fun while working out and I ran where there was no traffic so I could listen while being safe. I can play the Story Run over and over and found the run was done before I knew it. Unlike traditional podcasts and audiobooks, Runtastic Story Running offers listeners interactive running experiences that are built to 35-minute interval training plans. In The Scorch Trials: Hunted, the listener slips into the role of the narrator and joins a powerful organization at the heart of the newest Maze Runner movie. To beat the bounty hunters and survive the dangerous city full of Cranks who have been infected by the Flare virus, the only option is to run. Written by Spencer Baum and narrated by Robert Forge, the story was specifically designed to meet the needs of runners. Perfectly aligned cinematic sounds, produced by David Ritt, accompany the story and push listeners to peak performances by speeding up or slowing down the pace. To download the Story Run it is user friendly and is available on iOS, Android and Windows. Simply download the flagship Runtastic app, open the “Story Running” tab in the drawer menu and select the in-app purchase. To see more of Christine’s work online visit her at www.runwithit.ca, on twitter at @christineruns, or on Youtube at runwithitcb1. From no marathons to two marathons in five weeks-what was I thinking? Beating the demon at the 115th Boston Marathon, 2011. The 2010 Boston Marathon "was like a rock concert for 26 miles." This was the comment made by Gary William, a first-time participant.